It's been a long haul! The way-finding columns and seats are finally in place along the Matakana - Pt Wells cycle and walkway. A glimpse of Littel Barrier just by the trees in the middle; rather a grey day...normally much more sunshine of course! 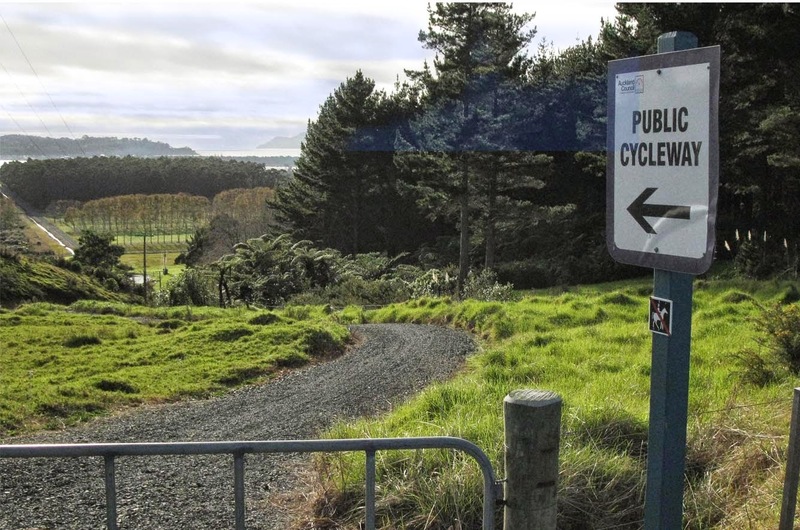 Strategically sited resting places at the highest point on the seven kilometre pathway encourage users to take a break and admire the views; looking North across Omaha Flats, the orchards, market gardens and beach settlement of Omaha, Little Barrier Island is visible on the horizon. On the other side of Takatu Rd, looking back towards Matakana, the view is over farmland and a gully with undevelopedwetland. The local community has worked hard overthe last few years to firstly instate the pathway and then get planting underway. In years to come these efforts will be appreciated as the shrubs and trees reach maturity and add to the variety and visual richness of the walk. Starting (or ending depending on where you set off from!) in Matakana and after a careful walk over the road bridge (and I stress careful!) the cycleway proper starts. Plans are well developed and the community is optimistic that a pedestrian bridge will be in place for next summer. A short distance along Tongue Farm Rd and on the right you'll see our pottery, a great spot to fortify for or recuperate from the journey! All the terracotta columns were made on site and depict in stylised form the topography of the land and the route being followed. The clay still looks new, but over the months and years it will weather and start to become a natural element in the landscape. The warmth and tactility of terracotta very much lends itself to landscaping features and we are planning to make more garden furniture and ornaments, so let us know if you have any ideas! Cyclists stop to admire the columns and check they're heading in the right direction.